House completely renovated on three floors with exposed beams. Private entrance. Ground floor: living room, fireplace, double sofa bed, bathroom and kitchen; first floor: double bedroom, bathroom, office; second floor: attic room, two single beds. Private garden and two covered parking. Large garden of the condominium with swimming pool. Nearby: supermarket COOP, tennis courts, train station and village of Asciano (restaurants, cafes, museum and shops). 10 minutes by car: Rapolano Terme thermal baths, Monte Oliveto Abbey, horse riding. 20 minutes by car: Siena, the outlet shopping center of Valdichiana (big brands) Montepulciano, Montalcino, Arezzo and Lake Trasimeno. 1 hour from Florence and 2 hours from Rome. We had a great holiday; the house is fully equipped to self-cater & enjoy the setting.The views from the house are beautiful and very relaxing & the pool was perfect for our children (9-13 yrs). It takes approx 20 mins to walk into the centre of Asciano where you will find a Co-Op, a few restaurants & some bars. A car is a must to explore the local area, we visited Siena, Arezzo, St. Gimignano & Montepulciano & although busy still enjoyable. The beauty & appeal of this house is that you could stay there in all seasons, the house has a wood burner & I think it would be very cosy in the autumn/ winter months. We would highly recommend this house and would love to stay here again in the future. This house is lovely inside and out in a quiet, peaceful location. Very conveniently located only about a 10 minute walk to the grocery store and 15 minutes to the train station. The center of Asciano is only another 10 minute walk beyond the train station. The home has everything you would need inside and out -- an inviting patio with incredible views of the Tuscan hills, private garden, shared swimming pool. We used the bicycles several times since we did not have a car with us. This is a great place to stay with many things to do in the surrounding area and the convenience of a nearby train station to venture further afield. Thanky you Mary!!! We are happy that you appreciated your stay in our house!!! All the best! The village of Asciano is well off the normal beaten tourist track and much the better for it. The property we stayed in is on the edge of town and has stunning views of the surrounding farmland. 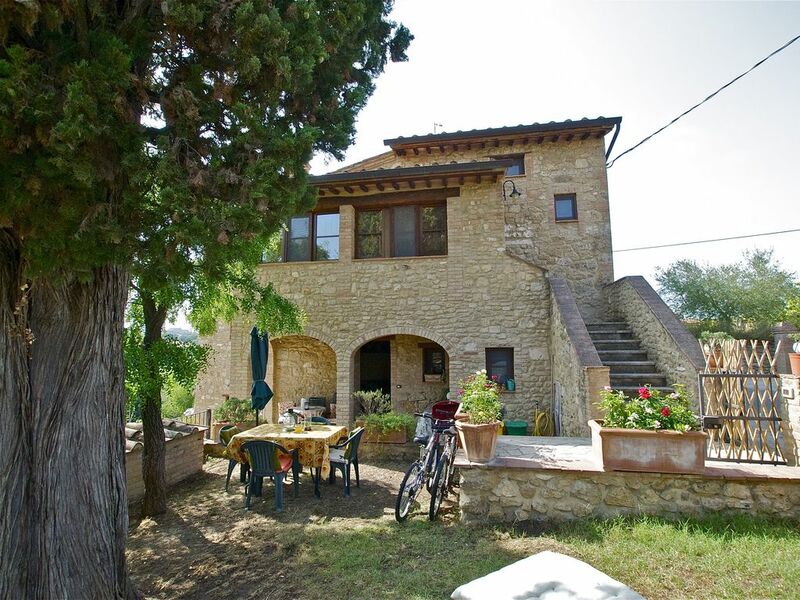 Asciano is very well situated for forays into Tuscany and Umbria. Siena is 30 km from the village and Florence is an hour away and Pisa two hours away. The apartment is described as having two bedrooms, however the second bedroom is little more than an attic with a very low ceiling and really only suitable for small children. In the heat of the Tuscan summer this room is not really livable. There is, however, a sleeper couch in the living room which is comfortable enough. I would thoroughly recommend this accommodation for families. There is a beautiful swimming pool in the complex for a cooling dip after the day's adventures in the surrounding country. We really enjoyed our stay in Asciano. Thank you! Das Haus ist eher für Familien geeignet als für 2 Paare. Die 2 Schlafplätze im Dachgeschoss sind wenig komfortabel (sehr geringe Raumhöhe) und nur über eine steile Treppe zu erreichen. Gut organisierte Übergaben, Dorf und Einkaufmöglichkeiten auch zu Fuss erreichbar. Many thanks for your comment but as I always tell to my guests if they are two couples the ideal is to take the master bedroom at the first floor with bathroom for one couple and for the other one the best thing is not the 2 beds at the second floor (better for children) but the double sofa bed in the living room with bathroom attached. Wir (2 Erwachsene, 1 Kind und 1 Jack Russel Terrier) waren Ende August / Anfang September in diesem wirklich schönen Haus. Gute Ausstattung - alles da. Pool ist auch prima - hat ein ganz besonderes Ambiente auf Grund der Lage - wird mit mehreren Parteien geteilt ist aber wirklich unproblematisch. Der eigene Garten ist klein, fein und privat. Tolle Aussicht auf die sehr schöne und typisch 'toskanische' hügelige Landschaft. Würden wir wieder nehemn - und ... auch wichtig: Vermieterin sehr nett und kooperativ. Klare Empfehlung! Buona ,calda per una famiglia. Grazie Maurizio!! Sempre pronti a ospitarvi! Spero ad una prossima volta! Do not miss ... the Baths of Rapolano Terme (10 min by car. ): Terme di San Giovanni o Querciarola! Animaux admis de petite taille mais surtout calmes car il ne pourront pas accéder au jardin de la copropriété, mais uniquement dans notre petit jardin privé et il ne doivent pas déranger les voisins.